Does your enterprise wish to improve customer satisfaction? Use our software platform to learn more about your customers and put that knowledge to use. Our platform operates not only on customer data, it puts that data to work generating value. Our team serves customers in 45+ countries across 4 continents. We enjoy a 70% market share in the Indian telecom industry. Ten years of experience in the telecom and insurance industries cements the value of our award-winning product portfolio. 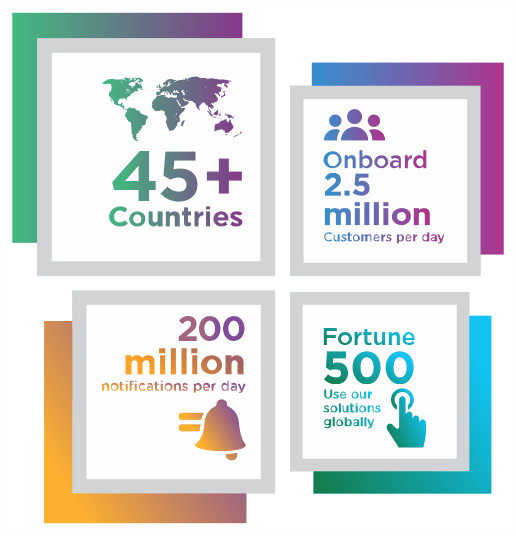 Today, we help onboard millions of customers daily, and maintain a customer database of 500 million individuals across our engagements. Intense Technologies produces software products that are designed for digital business transformation. Our platform is cloud-based and designed to seamlessly integrate with our clients’ existing systems. There is no need to rip and replace existing assets, ensuring a rapid return on investment despite technological barriers. We constantly harness our creativity and zeal to deliver world-class software products that fetch substantial returns, creating top-line and bottom-line growth for our global clients. We aspire to achieve global leadership across all the industries we work in. Our vision puts us on track to be a globally renowned company.